Gas boilers are an energy and cost-efficient heating option. In scanning new gas boiler reviews, you will find annual fuel utilization efficiency (AFUE) ratings of up to 99 percent, a level that can’t be reached with a gas furnace or oil boiler. The most efficient gas boilers are expensive, but they can bring significant savings on energy bills in the long run. Here are some energy-efficient gas boiler reviews. The English Baxi company consistently earns positive gas boiler reviews and won boiler of the year at the 2008 CORGI Awards for heating and plumbing. Baxi sells six Energy Star-approved Luna models with at least 92.5 percent AFUE. The Luna models are compact wall-hung models with a 10-year limited warranty. One of the most impressive Baxi gas boiler reviews came from a mechanical contractor in Wasilla, Alaska. "It can be 30 below zero here for three weeks straight, so a reliable heating appliance is essential for both home comfort and survival. I have not experienced any significant problem with Baxi Luna performance," he said. 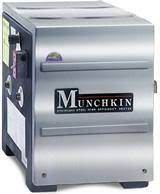 Heat Transfer Products claims its Munchkin compact boiler was the first high-efficiency boiler made in the United States. The various Munchkin models rate between 93 and 95 percent AFUE. The stainless steel boilers have a 12-year limited warranty. Munchkin gas boiler reviews are mixed and installation can be tricky. However, the Munchkin is reliable and durable if properly installed. The LAARS NeoTherm condensing hydraulic boiler rates at least 95 percent AFUE, and comes with a 12-year warranty. Gas boiler reviews praise the LAARS Integrated Control System, which comes standard on the NeoTherm. The ignition, temperature and other settings can all be remotely controlled and easily added to home automation systems. Gas boiler reviews also note the NeoTherm’s simple and inexpensive installation. LAARS also makes the Endurance. It is less efficient, but it outlasts its 20-year warranty, according to most gas boiler reviews. LAARS, Heat Transfer Products and Baxi have earned some of the top gas boiler reviews. Look for long warranties and high AFUE ratings when comparing gas boiler reviews. Once you've chosen the right gas boiler for your home, find a reliable HVAC contractor to install it.